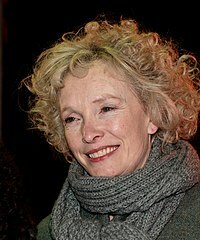 Lindsay Vere Duncan, CBE (born 7 November 1950) is a Scottish actress. On stage she has won two Olivier Awards, a Tony Award for her performance in Private Lives and a Tony Award nomination for her role in Les Liaisons Dangereuses. Duncan has starred in several plays by Harold Pinter. Her best known roles on television include: Barbara Douglas in Alan Bleasdale's G.B.H. (1991), Servilia of the Junii in the HBO/BBC/RAI series Rome (2005–2007), Adelaide Brooke in the Doctor Who special "The Waters of Mars" (2009) and Lady Smallwood in the BBC series Sherlock. On film she portrayed Anthea Lahr in Prick Up Your Ears (1987), voiced the android TC-14 in Star Wars: Episode I – The Phantom Menace (1999) and Alice's mother in Tim Burton's Alice in Wonderland (2010), and played the acerbic theatre critic Tabitha Dickinson in Birdman or (The Unexpected Virtue of Ignorance) (2014). She was appointed Commander of the Order of the British Empire in the 2009 Birthday Honours for services to drama. Duncan was born in Edinburgh, Scotland, into a working-class family; her father had served in the British army for 21 years before becoming a civil servant. Her parents moved to Leeds, then Birmingham, when she was still a child. Duncan attended King Edward VI High School for Girls in Birmingham through a scholarship. Despite her origins, she speaks with a received pronunciation accent. As of 2011, her only role with a Scottish accent is AfterLife (2003). Duncan's father died in a car accident when she was 15. Her mother was affected by Alzheimer's disease and died in 1994; she inspired Sharman Macdonald to write the play The Winter Guest (1995), which was later adapted as a film by Alan Rickman. Duncan's first contact with theatre was through school productions. She became friends with the future playwright Kevin Elyot, who attended the neighbouring King Edward's School for boys, and followed him to Bristol, where he read Drama at university. She did a number of odd jobs while staging her own production of Joe Orton's Funeral Games. Duncan joined London's Central School of Speech and Drama at the age of 21. After her training, she started out in summer weekly rep in Southwold to gain her Equity card. She appeared in two small roles in Molière's Don Juan at the Hampstead Theatre in 1976, and she joined the Royal Exchange Theatre, Manchester when it opened. She performed in the very first productions at the Royal Exchange and appeared in eight plays in Manchester in the next two years. In 1978 she returned to London in Plenty by David Hare at the National. She appeared on the television in small roles in a special episode of Up Pompeii!, in The New Avengers, and a commercial for Head & Shoulders shampoo. She made her breakthrough on Top Girls by Caryl Churchill, staged at the Royal Court in London and later transferred to the Public Theater in New York: her performance as Lady Nijo, a 13th-century Japanese concubine, won her an Obie, her first award. Next year she took her first major role on film in Richard Eyre's Loose Connections with Stephen Rea. At the same time her television work included a filmed version of Frederick Lonsdale's On Approval (1982), Reilly, Ace of Spies (1983) and Dead Head (1985). In 1985 she joined the Royal Shakespeare Company for the production of Troilus and Cressida, in which she played Helen of Troy. In September she created the role of the Marquise de Merteuil in Les Liaisons Dangereuses, the play by Christopher Hampton after the French novel by Choderlos de Laclos. The play opened at The Other Place in Stratford-upon-Avon. On 8 January 1986 the production transferred to the 200-seat theatre The Pit in London's Barbican Centre, with its original cast intact. In October of the same year the production moved to the Ambassadors in the West End. In April 1987 the cast, including Duncan, took the play to Broadway. For her performance she was nominated for a Tony and won the Olivier Award for Best Actress and a Theatre World Award. She was replaced by Glenn Close for Dangerous Liaisons — Stephen Frears's film of the play; similarly John Malkovich was selected for the role of Valmont instead of Duncan's co-star Alan Rickman. In 1988 Duncan won an Evening Standard Award for her role of Maggie in Cat on a Hot Tin Roof by Tennessee Williams. At the same time she became a regular in the plays of Harold Pinter and the television work of Alan Bleasdale and Stephen Poliakoff. She performed for a second season with the RSC in 1994–1995, in A Midsummer Night's Dream in which she played the double role of Hippolyta and Titania, replacing Stella Gonet from the original production cast. She went on tour in the United States with the rest of the cast, but back and neck pains forced her to in turn be replaced by Emily Button from January to March 1997. Impressed by her performance in David Mamet's The Cryptogram (1994), Al Pacino asked Duncan to play the role of his wife in City Hall (1996) by Harold Becker. To please her young son, a Star Wars fan, Duncan applied for the role of Anakin Skywalker's mother in Star Wars: Episode I – The Phantom Menace (1999) but was not cast; she finally accepted to voice an android TC-14. She reunited with Alan Rickman in a revival of Noël Coward's Private Lives (2001–02) and won a Tony Award for Best Actress and a second Olivier Award for her performance as Amanda Prynne; she was also nominated the same year for her role in Mouth To Mouth by Kevin Elyot. Duncan played Servilia Caepionis in the 2005 HBO-BBC series Rome and she starred as Rose Harbinson in Starter for 10. Aged by make-up, she played Lord Longford's wife, Elizabeth, in the TV film Longford. In February 2009, she played British Prime Minister Margaret Thatcher in Margaret. In November 2009, Duncan played Adelaide Brooke, companion to the Doctor, in the second of the 2009 Doctor Who specials. Duncan played Alice's mother in Tim Burton's 2010 film Alice in Wonderland, alongside Mia Wasikowska, Johnny Depp and Helena Bonham Carter. She also starred in the original London run of Polly Stenham's play That Face at the Royal Court co-starring Matt Smith and directed by Jeremy Herrin. She did the narration for the Matt Lucas and David Walliams 2010/2011 fly-on-the-wall mockumentary series Come Fly with Me on the BBC. In October–November 2010, Duncan starred in a new version by Frank McGuinness of Ibsen's John Gabriel Borkman at the Abbey Theatre, Dublin alongside her Liaisons dangereuses co-stars Alan Rickman and Fiona Shaw. The production transferred in January–February 2011 to the Brooklyn Academy of Music. Alan Bleasdale asked for Duncan to feature in his first work for television after ten years of absence, The Sinking of the Laconia, aired on January 2011; she plays an upper-class passenger in the two-part drama based on a true story of World War II. She also played the mother of Matt Smith in the telefilm Christopher and His Kind written by Kevin Elyot after Christopher Isherwood's autobiography of the same title. In October–November 2011, Duncan read extracts of the King James Bible at the National Theatre, London as part of the 400th anniversary celebrations of the translation. She played Queen Annis, ruler of Caerleon and antagonist of Merlin, in the 5th episode of the fourth series of BBC1's Merlin. She also appeared as Home Secretary Alex Cairns to Rory Kinnear's Prime Minister in "The National Anthem", the first episode of Charlie Brooker's anthology series Black Mirror. Duncan started 2012 as a guest in the New Year special of Absolutely Fabulous, playing the part of Saffy's favourite film actress, 'Jeanne Durand'. In February she returned to the West End in Noël Coward's Hay Fever with Kevin McNally, Jeremy Northam and Olivia Colman, once again under the direction of Howard Davies. Later in 2012, Duncan featured in BBC2's productions of Shakespeare's history plays. She played the Duchess of York in the first film, Richard II, with David Suchet as the Duke of York and Patrick Stewart as John of Gaunt. In October 2014, Duncan appeared as Claire in the revival of Edward Albee's A Delicate Balance on Broadway. That same year, she also featured in the film Birdman, or (The Unexpected Virtue of Ignorance), which won the Academy Award for Best Picture. Duncan is married to fellow Scottish actor Hilton McRae, whom she met in 1985 at the Royal Shakespeare Company. They live in north London. They have one son, Cal McRae, born September 1991. Duncan was appointed a Commander of the Order of the British Empire (CBE) in the 2009 Birthday Honours for services to drama. 1999 Expelling the Demon Woman Voice, short. 1993 A Year in Provence Annie Mayle Miniseries, all episodes. After Peter Mayle's book. 1994 The Rector's Wife Anne Bouverie Series, all episodes. After the novel by Joanna Trollope. 1999 The History of Tom Jones, A Foundling Lady Bellaston Miniseries, episodes 1, 3, 4, 5. After the novel by Henry Fielding. 1999 Oliver Twist Elizabeth Leeford Miniseries, all episodes. Adapted by Alan Bleasdale after Charles Dickens' novel. 2011 The Sinking of the Laconia Elisabeth Fullwood Miniseries (BBC), all episodes. Written by Alan Bleasdale. 2011 Black Mirror Home Secretary Alex Cairns Miniseries, first episode: "The National Anthem" (Channel 4). Written by Charlie Brooker. 2014–2017 Sherlock Lady Smallwood Episodes: "His Last Vow", "The Six Thatchers", and "The Lying Detective"
2015 Toast of London Herself Episode: "Global Warming"
1976 The Prince of Homburg Natalie Royal Exchange Theatre, Manchester. British premiere of the play. 1977 The Ordeal of Gilbert Pinfold Margaret Royal Exchange Theatre, Manchester. After a novel by Evelyn Waugh. 1981 Incident at Tulse Hill Rosemary Hampstead Theatre, London. Directed by Harold Pinter. 1985–1986 Les Liaisons dangereuses Marquise de Merteuil Royal Shakespeare Company: Ambassadors Theatre, Londres then Music Box Theatre, New York. Won – Olivier Award for Best Actress and a Theatre World Award; nominated – Tony Award for Best Actress. ^ a b c Walsh, John (18 January 1997). "The stainless steel queen". The Independent. Retrieved 20 June 2011. ^ a b c d e f Jackson, Kevin (23 October 2005). "Lindsay Duncan: When in Rome". The Independent. London. Archived from the original on 23 November 2007. Retrieved 7 May 2010. ^ Collins, Tony (7 May 2009). "Actress Lindsay Duncan helps Birmingham school celebrate". Birmingham Mail. Retrieved 20 June 2011. ^ a b c Burnside, Anna (26 June 2005). "The rose who showed her thorns". The Sunday Times. Retrieved 20 June 2011. ^ Bayley, Clare (25 January 1995). "Listening to the teenager within". The Independent. Retrieved 20 June 2011. ^ a b Lane, Harriet (23 April 2007). "Bad girl. Lindsay Duncan talks to Harriet Lane about her new play". The Guardian. Retrieved 20 June 2011. ^ "Thames Adverts, 25th January 1979 (1)". Retrieved 26 July 2010 – via YouTube. ^ "Lindsay Duncan". Masterclass, Theatre Royal Haymarket. Archived from the original on 4 November 2010. Retrieved 25 June 2010. ^ "The Tragedy of Troilus and Cressida". Royal Shakespeare Company. Archived from the original on 2 September 2015. Retrieved 25 June 2011. ^ Viner, Brian (May 2001). "Lindsay Duncan: The thinking man's femme fatale". The Independent. Retrieved 25 June 2010. ^ Saner, Emine (14 February 2009). "Saturday Interviews – Lindsay Duncan". The Guardian. Retrieved 26 June 2011. ^ "A Midsummer Night's Dream". Royal Shakespeare Company. Archived from the original on 6 January 2015. Retrieved 26 June 2011. ^ "The Royal Shakespeare Company's U.S. Tour - Robert Gillespie's Diary". Jane Network Productions. Archived from the original on 20 October 2010. Retrieved 26 June 2010. ^ "Lindsay Duncan's double-nomination triumph". Official London Theatre.co.uk. 17 January 2002. .
^ "Lindsay Duncan: I'm thrilled to be Doctor Who's new assistant". The Daily Record. 18 February 2009. Retrieved 18 February 2009. ^ "Lindsay Duncan to star in second Doctor Who Special of 2009". BBC Doctor Who. 18 February 2009. Archived from the original on 22 February 2009. Retrieved 18 February 2009. ^ Walsh, Fintan. "John Gabriel Borkman". The Irish Theatre Magazine. Archived from the original on 27 March 2012. ^ "John Gabriel Borkman". Brooklyn Academy of Music. Archived from the original on 20 July 2011. ^ Chalmers, Robert (12 December 2010). "In from the cold: Alan Bleasdale on his return to television after a decade in the wilderness". The Independent. ^ "King James Bible: In the Beginning — Cast and credits". National Theatre. ^ Jeffery, Morgan. "James Callis, Lindsay Duncan for 'Merlin' roles". Digital Spy. Retrieved 16 September 2011. ^ Brooker, Charlie (1 December 2011). "Charlie Brooker: the dark side of our gadget addiction". The Guardian. Retrieved 2 March 2012. ^ Kellaway, Kate (26 February 2012). "Lindsay Duncan: 'There's pain as well as laughter in Noël Coward's plays'". The Observer. Retrieved 2 March 2012. ^ Thorpe, Vanessa (29 May 2011). "Shakespeare gets the starring role in cultural celebration alongside Olympics". The Observer. Retrieved 20 June 2011. ^ Watkins, Mike (May 2011). "BBC Two to air Shakespeare works Richard II, Henry IV Parts I and II and Henry V". ATV Guide. Retrieved 20 June 2011. ^ McNulty, Charles (11 November 2014). "Lindsay Duncan finds her footing in 'A Delicate Balance'". The Los Angeles Times. ^ Wolf, Matt (5 May 2011). "Hilton McRae on Sharing the London Stage with Judy Garland in End of the Rainbow". Broadway.com. Archived from the original on 9 June 2011. Retrieved 20 June 2011. ^ "No. 59090". The London Gazette (Supplement). 13 June 2009. p. 7. "Lindsay Duncan resume". Dalzell & Beresford. Archived from the original on 17 December 2011. Sulcasmarch, Roslyn (7 March 2014). "Just Another Great Role for What's-Her-Name: Lindsay Duncan Stars in 'Le Week-End'". The New York Times.